Update: A Tunisian court has sentenced today blogger and journalist Slim Boukhdhir to one-year prison terms for “aggression against a public employee”. The outspoken Tunisian journalist and blogger Slim Boukhdir has been arrested on November 26 and charged with “aggression against a public employee” and “affront to public decency”. According to the Committee to Protect Journalists, the court denied his release and the hearing is scheduled to resume tomorrow, December 4th. Slim Boukhir could face up to 18 months imprisonment. 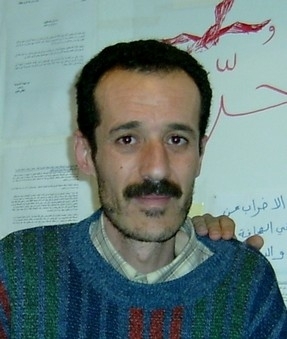 Slim Boukhdhir during his hunger strike. During the last year, Boukhdhir has undertaken numerous hunger strikes to denounce government harassment and political restrictions on his right to leave the country. His most recent hunger strike was held on November 1st to denounce the authorities’ refusal to grant him a passport. Slim Boukhdir is continuously being harassed, assaulted and threatened by both plain-clothes police and gangsters close to President Ben Ali’s brothers-in-law. After loosing his job as journalist in the “Akhbar Al-Joumhurya” (News of the Republic) newspaper on August 2004, Slim Boukhdhir started blogging on the Arabic Blog Service: Maktoob Blog. But in July 2007, his blog has been hacked and deleted. I took the liberty of using this photo of Slim for our website to announce his release from prison. Let me know in case you do not want us to use the image.